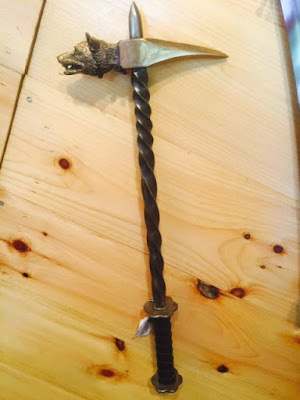 Saw this at the Maryland Renaissance Festival and thought this was a notable weapon/art piece. It's a War (Battle) Hammer with a spike on one side and an animal head for the hammer on the other. TV shows like Vikings and Z(i.e. zombie) Nation have made these sort of famous again. It's sort of crazy the things people used in the past to fight and kill with. Imagine getting clobbered with one of these...ugly! But before guns, when the battle was up close and personal, what choice did people really have to defend themselves with.